Red Yeast Rice for Cholesterol - Does Red Yeast Rice Lower Cholesterol? Tens of thousands of conventional medications were derived from plant products. Even the widely prescribed statin drugs for lowering cholesterol were first discovered in fungi. In the 1970's, competing pharmaceutical firms in the United States and Japan were testing a variety of plant extracts for their potential to lower cholesterol. The Americans had found that a toxic mold known as Aspergillus contained an unidentified chemical component that lowered cholesterol levels, and the Japanese research team focused its attention on a fungus called Monascus purpurea. The fungus the Japanese team studied had been used for nearly 1,000 years in Traditional Chinese Medicine to "invigorate the blood." 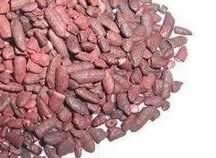 Known as anka, ang-kak, red fermented rice, koji rice, or red yeast rice, the fungus grew on rice and gave the grain a red color. The rice could be processed to make a natural red dye that Chinese chefs used (and still use) to make Peking duck, char siu (barbecued) pork, pickled tofu, and red rice vinegar. The cholesterol-lowering compound found in both Aspergillus and red yeast rice was the chemical compound lovastatin, initially named monacolin K by the Japanese researchers. When the two groups of researchers announced their discoveries, it was assumed that the two cholesterol-lowering products were different chemicals. By the time it was discovered that they were both the same chemical, Merck Pharmaceuticals had a patent to synthesize lovastatin and sell it as a prescription drug called Mevacor. The Japanese product became the nutritional supplement red yeast rice. Just As Good As Mevacor? The lovastatin in red yeast rice is just as good as Mevacor. In fact, the lovastatin in red yeast rice is Mevacor. But the US Food and Drug Admistration took steps to make it difficult for supplement makers to sell red yeast rice and easy for Merck to sell Mevacor. In 2001, the FDA decided that nutritional supplement manufacturers could sell "raw" red yeast rice with variable lovastatin content, but that they could not standardize their products to deliver a reliable dosage of lovastatin for lowering cholesterol. Since most people want to use the lowest dosage of a supplement that works, sales of red yeast rice plummeted and most brands were taken off the market. In 2010, red yeast rice began to reappear in the United States market. Makers of red yeast rice simply say that the yeast is "fermented according to traditional Asian methods" without making any claims for whether the product actually can lower cholesterol. The simple fact is that red yeast rice contains many more chemical constituents than just lovastatin. A 1,200 mg capsule of red yeast rice usually contains 2 to 10 mg of lovastatin, although some brands will contain no lovastatin at all, and some Chinese brands are spiked with artificial lovastatin. Over the years there have been 93 clinical trials of red yeast rice as a treatment for high cholesterol and for prevention of heart disease. Only two of the clinical trials were published in English-language publications. The trend of these studies is that red yeast rice reduces heart attack rates by about 50% and deaths from all causes by about 33%. This is comparable to treatment with Mevacor. In 2009, American researchers reported a clinical trial in which patients who had bad reactions from statin drugs (muscle breakdown, kidney failure, and/or memory loss) were put on red yeast rice or a placebo. Three out of 31 patients on red yeast rice had to stop treatment because of muscle pain or diarrhea. Of the 28 who completed the study, LDL cholesterol levels fell an average of 21%. So Red Yeast Rice Lowers Cholesterol? What About Side Effects? Only about 10% of participants in the American clinical trial of red yeast rice had to drop out because of relatively minor side effects but there have been isolated reports of serious side effects from the use of red yeast rice by people in China. There have been several reports of rhabdomyolysis, breakdown of muscle tissue that can cause kidney failure because of high protein levels, and one case of liver failure. The reports of side effects from red yeast rice are fewer than those for Mevacor, but they do exist. Red yeast rice may also, like statins, deplete coenzyme Q10. So why would anyone use red yeast rice? Taking red yeast rice makes sense if you want the benefits of a statin drug but you and your doctor believe you might do better on a very low dose. In China, red yeast rice is usually reserved for type 2 diabetics whose primary issue is inflammation rather than high LDL levels. There may be some good brands of red yeast rice made in China, and when I become aware of them, I will update this page. In the meantime, choosing a brand of red yeast rice not made in China will keep your dosage on the safe side, and you may see significant reductions in total cholesterol and LDL cholesterol in about two months. If you take a product not made in China, however, you probably won't experience changes in cholesterol until you have used it for at least a month. Becker DJ, Gordon RY, Halbert SC, French B, Morris PB, Rader DJ (June 2009). "Red yeast rice for dyslipidemia in statin-intolerant patients: a randomized trial".Ann. Intern. Med. 150(12): 830-9, W147-9. Gordon, R. Y.; Cooperman, T.; Obermeyer, W.; Becker, D. J. (2010). "Marked Variability of Monacolin Levels in Commercial Red Yeast Rice Products: Buyer Beware!" Archives of Internal Medicine 170(19): 1722-1727. Zhao SP, Lu ZL, Du BM, et al . (February 2007). "Xuezhikang, an extract of cholestin, reduces cardiovascular events in type 2 diabetes patients with coronary heart disease: subgroup analysis of patients with type 2 diabetes from China coronary secondary prevention study (CCSPS)".J. Cardiovasc. Pharmacol. 49(2): 81-4.